To further honor those who have been awarded the Carnegie Medal, the Hero Fund is pleased to offer at no cost a bronze grave marker to the families of deceased awardees. 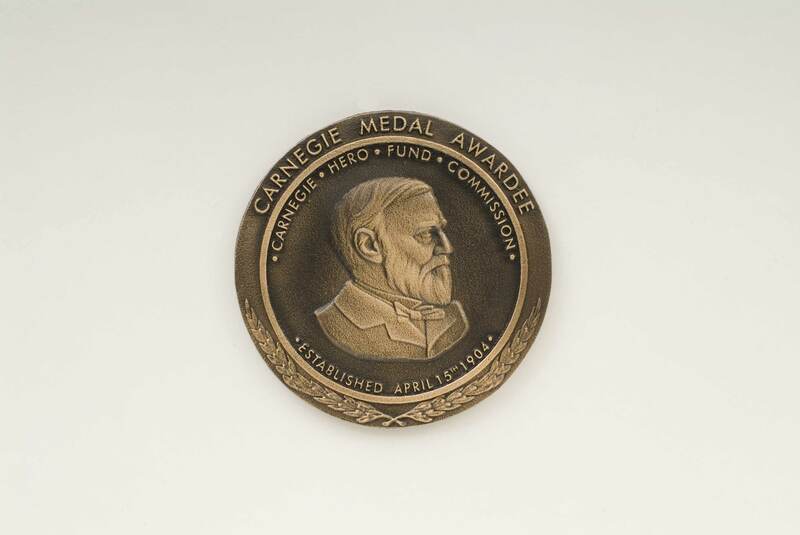 The size of the medallion is 3.75 inches in diameter and is designed to replicate the look of the Carnegie Medal. It can be displayed on an awardee’s stone or bronze headstone or on a flat-faced urn. The medallion will be sent with a packet containing supplies to affix it and directions for application. To order the medallion email us at carnegiehero@carnegiehero.org, or call toll free, 1-800/447-8900 and ask to speak with Susan M. Rizza. The Carnegie Hero Fund Commission grave marker medallion has been designed and produced by Matthews International Bronze Corp. of Pittsburgh, America’s largest produce of bronze memorials. The medallion is intended for mounting on horizontal, slanted, or vertical metal or stone surfaces. Mounting can be done with only the enclosed silicone adhesive, or the adhesive can be used along with mounting pins (not enclosed in the package). The adhesive is extremely durable and strong, and Matthews has assured us that it has been widely used in similar applications. Follow the directions on the enclosed supply of Momentive RTV-108 product. Wipe away any excess adhesive from the edge of the insignia. Immediately after application, the medallion should be held in place with masking tape for 24 hours to allow adhesive to cure.